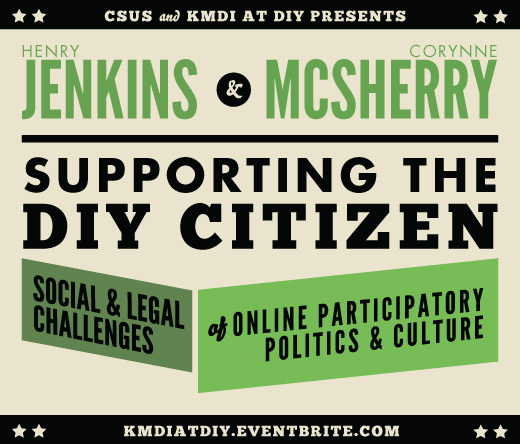 The Knowledge Media Design Institute is hosting the opening event for the DIY Citizenship: Critical Making and Social Media Conference on Thursday November 11, 2010, 5-7 pm at the Tanz Neuroscience Building, 6 Queen’s Park Crescent, West (enter through the side door). The event is FREE and open to the public, but you need to RSVP in order to help us figure out catering numbers (RSVP here). Henry Jenkins is the Provost’s Professor of Communications, Journalism, and Cinematic Arts at the University of Southern California and the former co-director of the Comparative Media Studies Program at MIT. He is the author or editor of 13 books on various aspects of media and popular culture, including Convergence Culture: Where Old and New Media Collide and Democracy and New Media. He blogs at henryjenkins.org. His accomplishments as a public intellectual include speaking to the Federal Communications Commission, the United States Senate Commerce Committee, and the Governing Board of the World Economic Forum, as well as writing a white paper for the MacArthur Foundation on participatory culture and learning. Corynne McSherry specializes in intellectual property and free speech litigation, with representative cases including Chamber of Commerce v. Servin, et al (trademark parody), Lenz v. Universal (copyright misuse), and MoveOn.org et al. v. Viacom (copyright misuse), as well as numerous amicus briefs on trademark, copyright and patent issues. She regularly comments on fair use, free speech and innovation on radio and television, including NPR, CNBC, CBS, and Fox News’ O’Reilly Factor, and in news publications such as the Wall Street Journal, the Los Angeles Times, Rolling Stone, the Boston Globe, CNET News, and Wired News, as well as numerous legal publications. Prior to joining EFF, Ms. McSherry was a litigator at Bingham McCutchen, LLP, and wrote Who Owns Academic Work? : Battling for Control of Intellectual Property (Harvard University Press, 2001). Should be super awesome–come and check it out!